The US coal industry is in trouble. It is being squeezed by slower expected coal demand from China, new environmental regulations, and in particular by cheap abundant US natural gas. Take Ohio for example. 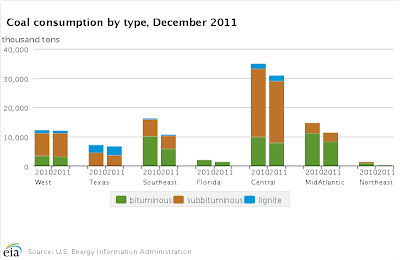 Three major natural gas fired power plants that in the past were used for peak generation only (to supplement coal powered plants during peak demand hours in the summer), are now used throughout the year. EIA: In Ohio, the Hanging Rock, Waterford, and Washington power plants are three combined cycle plants with a combined capacity of 2,698 megawatts that have increased their generation significantly since 2008 (see chart above). These combined cycle plants are highly efficient in using natural gas to produce electricity, with each having an average heat rate around 7,200 Btu/kWh. These three plants made up 8 percent of the electricity generation in Ohio during 2011 and 13 percent in December. In 2008, these three facilities only produced 1 percent of the electricity generated in the state. 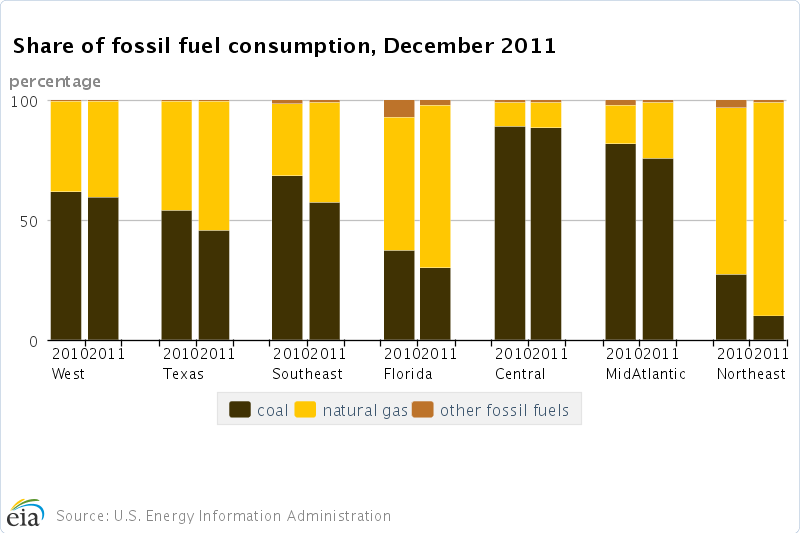 On the other hand the usage of coal powered plants has been declining. EIA: Seven coal plants in Ohio (with a combined capacity of 7,113 megawatts and an average heat rate around 10,500 Btu/kWh) have experienced a significant drop in generation in recent years. In the chart below, the generation share of these seven sample coal plants, expressed as its share of total generation from both sample coal and natural gas plants, is compared to the corresponding share of the three combined cycle plants. This trend is not limited to Ohio. 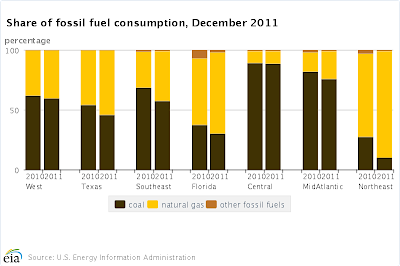 Here are the national statistics comparing the last two years of coal vs. natural gas usage. Below is the percentage of power generated using natural gas in the US. As discussed before, mild weather and ample supply have brought natural gas prices to historical lows. Most analyst believe that this is a near to medium term issue. 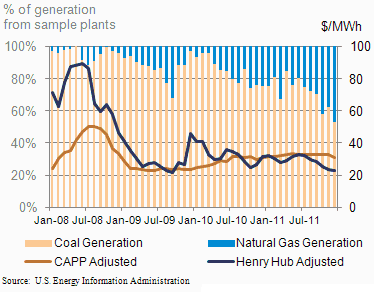 But the stabilization in natural gas prices will come at the expense of coal. A recent report from JPMorgan did a good job describing the squeeze on the coal industry from natural gas. JPMorgan: ... contract renegotiations; mine closures; and permanent replacement of coal-fired generation are all underway and will largely solve the problem [of low natural gas prices] down the road. There is significant anecdotal evidence to suggest that a scramble is underway for expanded coal storage capacity at generation sites that have seen extended periods of gas-fired displacement, and that many traditional coal buyers are balking at taking contracted volumes at prices that are well higher than current spot prices. Clearly, we are seeing lower coal burns, lighter production volumes and fewer rail loadings as gas takes an increasing market share in the power generation arena. Central Appalachian coal has been the primary target — given its relative expense and the expense of many shipping contracts, particularly to the US Southeast — and this week saw yet another announcement of an Appalachian coal company slowing mine production. Coal consumption, though still the dominant source of power generation, is declining across the board. In effect the vast reserves of US natural gas, made available via shale extraction, have become what Silicon Valley often refers to as a "disruptive technology". The disruption is now taking place in the US coal industry.